Briiiing, briiiing! Mid-August, middle America, and we’re back in school. Every year when backpacked kids return to the sidewalks and yellow busses fill the streets, I can still hear the bells ringing down the crowded halls, smell pencil cases and reused textbook pages, and sense the anxiety of mid-term exams even though I’d paid attention in class and nearly pulled an all-nighter studying. Thanks for joining the dVerse poetry prompt this evening. I’m Amaya Engleking and I’m wondering, what images or senses fill your minds when you think back on your school days? 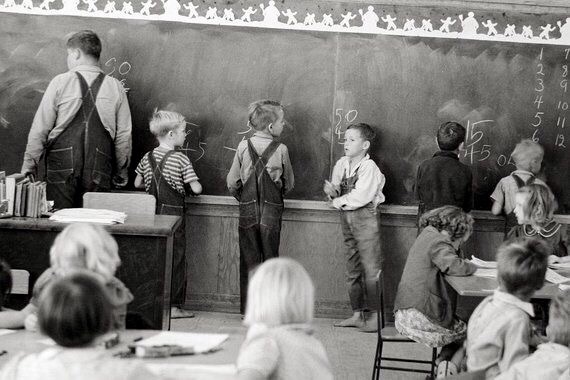 Was there a particular lesson that still stands out today as the pinnacle of your primary education? Did you have a teacher who made all the difference? Any embarrassing or hilarious moments that happened on campus and you couldn’t forget even if you tried? Is some seemingly minor detail associated with a particular classmate or classroom and now, for example, whenever you look at a chalkboard you can’t help but think of quirky Mr. Barnhart who would tap it three quick times before graphing the function. Or are you like our beloved Shel Silverstein and can remember playing hooky most of all? You can play the pleading “Hello Muddah, Hello Fadduh” card in your poem as well, or you may choose to elaborate on how you just adored school all the way from the first days of boxed milk and pigtails. The form is open but try to be as detailed as possible in order to ‘school’ us in your poetry. Hey mates. August has always been my least favorite month because going back to school was kind of a bummer. The only thing that I looked forward to was softball practice after school, ready after summer pickup baseball games and home run derbies. I’ve lately been spending a lot of time with my husband’s sisters who are going back to school (high school and college) and it got me thinking about those days, oh so long ago. How about you all? What subjects/classes/extracurricular activities did you enjoy? hey Amaya! Hey dVerse Poets. My favourite lessons were English, Art and Music, and I loved going back to school! Music, yes! I once ran for student senate and had to give a speech and have my class vote and everything. But when I was elected in for the next semester, I found out the class was the same period as orchestra. I resigned so fast. Man, I really let my constituents down, haha! Thanks for hosting, Amaya! I added one about dreams I would get (but no longer) about school. Try as I might I couldn’t figure out what classes I was taking and the semester was almost over. Here in Ontario, Canada, kids don’t go back to school till the first week of September, so school thoughts are still far away. I suffered severe allergies as a kid and I remember returning to class every year with a red, runny nose. (Although, this is not what I wrote about). Thanks for the prompt and the stroll down memory lane, Amaya. It seems to be earlier and earlier every few years. When I was younger it wasn’t until September that we had to sharpen our pencils. We actually got a summer. Thanks for joining in, as your contribution was astounding. I can’t imagine a mother saying that to her daughter. Very good prompt! There are a lot of mixed memories of school that come to mind! I have a poem about teaching instead of being a student. I’ll give it some more thought tho. Thanks for a great prompt Amaya! It is so good to leave the real world for a while tonight and enjoy spinning a school tale with you all! When I think of school, I think of gradually becoming. I think of trying on characters to see the me that I might eventually become. Silly stories in elementary school, yes, but in high school, we were strangely serious. Adulthood was within our grasp and we were elated and scared as heck. Loved this prompt.